Departments are one way that MoneyWorks Gold provides to simplify your account codes. Although not applicable to every user, they can be extremely useful in the right situation, typically where there are a number of entities that have a similar cost and/or revenue structure. Departments can also simplify reporting. Most reports in MoneyWorks can be printed for the entire company or for just selected departments. Consider as an example a construction company who has several major residential and commercial projects, and also has a couple of vehicles. Each project and vehicle can be represented as a Department (cost-centre) in MoneyWorks. Departments are organised into Groups, so that the projects are in a group "Project", and our vehicles are in a group "Vehicle". In the general ledger, the accounts that are directly concerned with project income and expenditure are assigned to the Group Project; those that are concerned with Vehicle costs (petrol, repairs, insurance etc) are assigned to the Vehicle group. These are referred to as Departmentalised accounts. Other accounts, such as office overheads, are not assigned to a group. When an account is departmentalised in this manner, an individual ledger account is created for each department in the group, allowing for direct coding, budgeting and reporting. When an entry is made in a transaction against a Departmentalised account, the department must be specified. Thus if Truck2 incurs repairs, we must code the expense as shown. 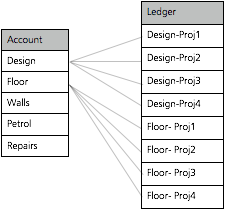 If a new Department is added to a Group, the required new ledger records are automatically created. Thus if the construction company gets a new residential job PROJ4, just adding this to the appropriate Group (Project) will create the ledgers. 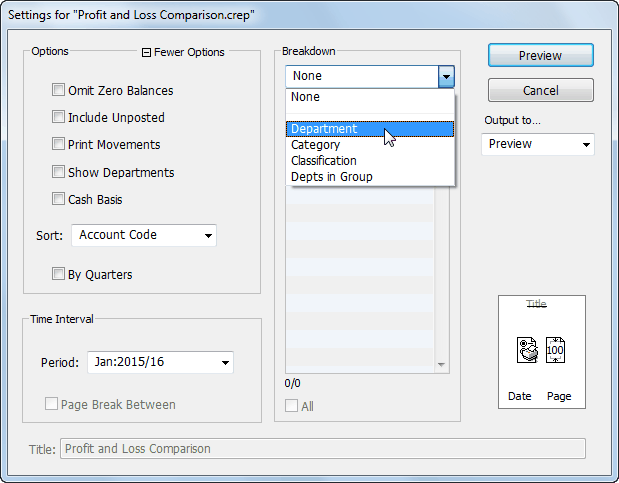 Most General Ledger based reports can be printed by Department (cost centre) or type of Department (Classification). The Report Settings allow you to run a consolidated report for the whole company, or reports that focus on a segment of the company. These segments include Departments and Classifications. Choosing Department displays a list of Departments, and we can select those we want to report on. A separate report is generated for each Department that is selected, with each report being pertinent to just that Department. Using Classifications we can get a consolidated report by type Department. Here we are looking at the total for Commercial projects. Departments can also be grouped for enquiry and reporting purposes by using Classifications. In a vehicle fleet for example, some of the vehicles might be diesel and some petrol. Some of the projects done by a builder might be residential and some commercial. Using classifications, we can easily see how the diesel fleet is performing compared to the petrol, or the residential side of the business compared to the commerical. Each department can also have its own set of budgets, and any of the budget reports can report on actual and variance performance by department (e.g. 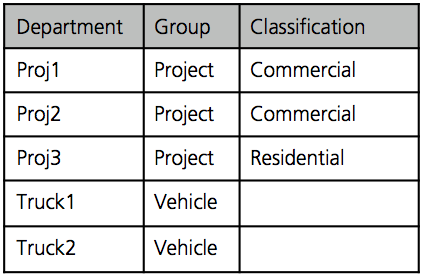 a specific vehicle), by classification (e.g. diesel vehicles), or consolidated for the whole company. Consider using departments whenever you have several items that are essentially the same (e.g. products, projects, staff, vehicles), and that you need to track income or expenses individually for each one. You need to create a Department for each item, and then put like Departments into a Department Group—basically a container that collects the items together (e.g. a group of projects). Every time you start a new project, you create a new department and add it to the group, and when a project is complete, you remove it from the group. You can of course have several groups. You might have a group of projects and a group of vehicles. Some of the expenses that are incurred will be specific to a vehicle (for example Insurance, Repairs and Maintenance), and some will be specific to a project (for example Material Usage). 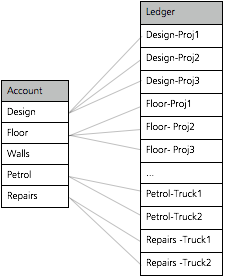 In your chart of accounts you will have a single code for each of the main activities. 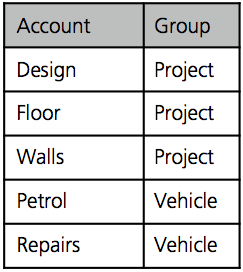 You then identify which Department Group is appropriate for each of the account codes. So you will assign the group Projects to account Material Usage, and the group Vehicles to Vehicle Insurance as well as Repairs and Maintenance. When you assign a Department Group to an account code MoneyWorks Gold automatically creates a subledger for each department that is a member of that group. Thus if there are four vehicles in our vehicles group, we would get four subledgers in each of our vehicle insurance and vehicle repairs and maintenance accounts. If we add more vehicles to the group, new subledgers are built for us automatically. When an account is departmentalised like this, you access individual subledgers through a suffix on the general ledger code. Thus if we had a department code of “RED” for the red Toyota, and a code of “320” for Vehicle Expenses, we would use “320-RED” to identify Vehicle Expenses for the Red Toyota. The hyphen is used to separate the general ledger code from the suffix.